I usually try to find cartoons to load on our Netflix player for our daughter to watch after school. 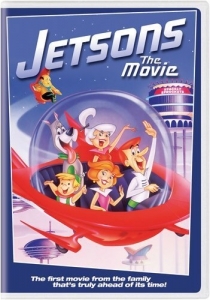 Yesterday morning, I found one I have seen parts of; The Jetsons Movie and I put in on there for her. just started watching it last night when I got home from work so I sat down to watch it with her. It was actually a bit better than I expected. The movie, which I believe was made in the 90s, had the same cast from the cartoon. Only George has been promoted to vice president and, as part of the promotion, has to move to a plant on a different planet. plant and they have to figure out who is responsible. Overall, I liked this movie. There was a good mix of comedy and even drama and that mystery about who was doing the sabotage was pretty cool. about adapting whenever you are forced to live in a different environment. If you have kids, I would definitely recommend this movie. I know my daughter and I both enjoyed watching it and I’m sure she will take the time to watch it again in the future.